A Yorkshire poultry farm has embarked on ambitious plans to increase bird production by a third thanks to Yorkshire Bank. Patrick Wedgewood and his wife Lindsey, who operate North Riding farm in Tholthorpe, are replacing two existing poultry sheds in a move that will enable them to increase the number of birds on site from 130,000 to 174,000 per crop. The project is being assisted by a six figure funding package from Yorkshire Bank. It is part of ambitious plans to modernise and expand the farm, which Patrick and Lindsey farm in partnership with Patrick’s parents. 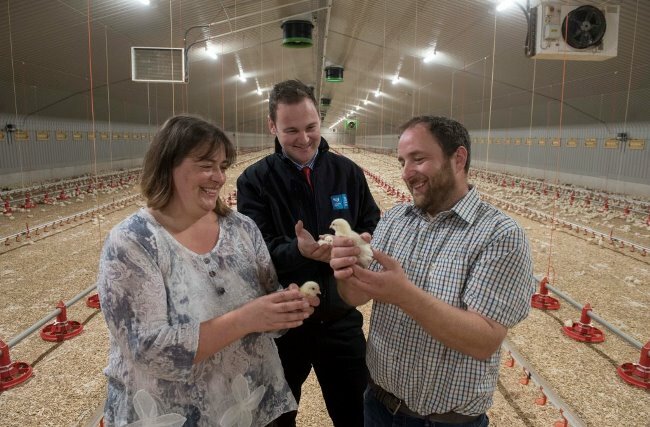 As well as installing the new poultry sheds, which are 66x400ft compared to the existing 40x400ft sheds, Patrick and his wife have added a biomass system to heat the sheds and reduce energy bills. The initiative was also funded by Yorkshire Bank. Patrick said: “As a family business, we have long enjoyed a strong relationship with Yorkshire Bank. As well as providing support, its knowledgeable team are always on hand with expert advice and invaluable insight into the market place. The deal was delivered by Gordon Blackwood, an agricultural relationship manager based at Yorkshire Bank’s North Yorkshire Customer Banking Centre. Rick Warburton, head of Yorkshire Bank’s North Yorkshire Customer Banking Centre, said: “Patrick and his family are highly experienced poultry farmers, with a strong understanding of what it takes to innovate and achieve growth.